Choquettes are the informal, slightly sweet cousin of cream puffs. With a sprinkle of crunchy pearl sugar instead of cream filling, these are perfect for elevated snacking. This post contains affiliate links which means I make a commission off of the links below with no additional cost to you. Please see my disclosure policy for more information. When we were in France a couple of years ago, I noticed choquettes for the first time. It probably had something to do with the fact that Prentice was a rather round cheeked, adorable two year old and the ladies in the bakery couldn’t seem to resist popping one of these sugary little puffs into his fists. This always made him lisp a little “merci!” that was so obviously American they couldn’t help but grin. I think America should jump on this band wagon. Instead of handing out sugar cookies at the grocery store bakery, why not one of these very cute, tasteful little treats? 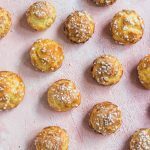 Pâte à choux (the base for choquettes) is typically made into cream puffs, but these are sprinkled with crunchy bits of pearl sugar. It light sweetness contrasts so well with the tender, eggy lightness of the pastry. And while the French name, or fact that people refer to choux pastry as “pre-cooked”, or any other thing that may make these seem unattainable, don’t be fooled. While I wouldn’t say these are “easy,” I would say that they’re simple. There aren’t a million steps, and even beginners can make an impressive choux. Even if you aren’t 100% happy with something about your first try, it’s likely that you’ll still end up with something enjoyable to eat and the inspiration to try again. Here are a few tips to help you get perfect choux no matter what. Some of these I’ve learned through trial and error, some from copious reading on the subject. I admit to being a nerd. Oh, and the star ingredient here? It’s the pearl sugar that gives them their little crunch. You probably won’t find it on the shelves of your average grocery store–it’s a fairly specialized item. This is the kind I ordered from Amazon, and I was really happy with it. A little goes a long way, so even this bag should last you a long time. Preheat your oven to 375° and line two large baking sheets with parchment paper or a silicone baking mat. Set out all of your ingredients before beginning and beat four of the eggs into a bowl until the are smooth. Place the milk, water, salt, sugar and butter in a saucepan. Bring to a boil, stirring occasionally with a wooden spoon to ensure the butter is melted before the water boils. As soon as the water and milk boil and the butter is melted, immediately remove the saucepan from the heat and add the flour all at once, mixing quickly. Return the saucepan to the stove and stir vigorously for 15-20 seconds until the mixture forms a ball around the spoon and is beginning to leave a film on the bottom of the pan. Remove from the heat. While still warm, transfer the choux dough into a pastry bag fitted with a piping coupler. In one continuous squeeze, make balls of dough that are about 1.5” on the tray, leaving at least an inch between them. Sprinkle the top of each dough ball with 1/4” tsp. of pearl sugar. Place the tray in the oven and bake for 20-30 minutes until golden brown and puffy. Cool on a rack. These are best eaten immediately, or at least the day they are baked. However, they can be kept in an airtight container for up to 3 days, or even frozen. To make them crispy again, simply put them out on a tray and bake for 3-5 minutes at 350°. Use both water and milk in your base. This will help get a shiny, browned outside that’s is slightly crisp and contrasts with the soft, light inside. Mise en place is essential here, not just a good idea. Set out all of your ingredients– presift your flour, beat four of the eggs, just generally make sure that you can add things quickly without having to stop to measure or prep ingredients. When piping out the puffs, don’t swirl or stack the dough, but rather create the ball of dough in one continuous squeeze. Any dough that is not part of the original squeeze will puff up separately and leave you with some strangely shaped puffs. Choux pastry that is going to be used for shells (like cream puffs or eclairs) benefit from the extra protein found in bread flour. However, I prefer these choquettes made with all purpose, as it tend to create a more tender interior. A bit of water on your finger will help you smooth down any bits of dough that are sticking out or lumpy.